1) Jurassic Park 3D is a movie that you must see in theaters. I would be remiss not to provide some relevant background information about my JP history. Although it is not my favorite movie (albeit solidly in my forever top ten), Jurassic Park is the most significant movie (and the experience that comes with it) of my cinematic lifetime. In the summer of 1993, fresh off a dozen (I wish I were kidding) readings of Michael Crichton’s brilliant original work, I was a full-fledged devotee of the Jurassic Park phenomenon. I intimately remember all four of my in theater viewings, especially the last one in September of 1994, a full year and a half after the original release, with my Dad at the Capitol Theatre in Arlington, a local throwback cinema that prides itself on its second and third run movie screening longevity (Back in 1994, it was not unusual for a movie like Jurassic Park to last in theaters for eighteen months. In today’s “get it now on demand” viewing culture, this would be unheard of.) During these beautiful and innocent few years, playing “live” Jurassic Park (with human raptors) was a near nightly occurrence in my “hearkening back to a simpler time” neighborhood. I still know a preponderance of the dialogue (especially all of Ian Malcolm’s lines – “Must go faster!”) and cannot meet an Ian without immediately hearing “Ian, freeze!” or a Tim without immediately hearing “Tim, no Tim!” in my head, often to the bewilderment of the new person I have met suspicious of my noticeably distracted state of mind. Action figure reenactments (Kenner: well done on dinosaurs, but questionable original work on the people characters) would span several yards outdoors or inhabit entire houses indoors. October 4, 1994, the day of the original VHS release, was coined “Jurassic Park Day” by me and my neighborhood compadres and featured a formal agenda of several interactive JP iterations (action figures, live action, video games) topped off with a group viewing in the comfort (or in retrospect, it was quite uncomfortable on that scratchy rug we used to have) of my basement. In later years, raptor voice and physical impersonations were standard fair during rehearsal breaks for my musical directing ventures in which I found new JP devotee people connections. Clearly, Jurassic Park holds a special (a gross understatement) place in the younger version of myself’s heart (Who am I kidding? This has not changed at all.) Today’s viewing at the IMAX at Jordan’s Furniture in Natick was a special experience (when the “buttkickers” first kicked in with the opening score’s pounding moans, the butterflies of nostalgia went on high alert) that completely delivered. 2) Jurassic Park (3D) has aged well. Steven Spielberg’s summer blockbuster, a pioneer picture for today’s now commonplace CGI laden movie, does not look like it was made in 1993 and rather appears much more real than your average CGI-infested wannabe of today. The integration of CGI with the late great Stan Winston’s creature shop (a wise move, Master Spielberg) creates dinosaurs that live and breath as we imagine the real thing would have. Yes, some of the dialogue and usage of computers (Lex’s pride about being a “hacker” or excitement over an interactive CD-ROM, Grant’s fear of computers, the entirety of Dennis Nedry’s workspace and Chicago font filled monitors – “Ah Ah Ah, you didn’t say the magic word!”) and the high rise on the female pants and shorts are more retro Real World than Real World: Portland, but this two decade distance does not detract from the viewing experience. Jurassic Park’s suspenseful potency and visual mastery remain ever much the thrill ride it always was. 3) John Williams breathtaking score is such a massive strand of the DNA of this fantastic movie. Several times during the viewing experience, the memorable score induced a pit of my stomach release or a plethora of goosebumps up and down my arm. It is the best kind of movie score – the kind that does not leave you after the running time of the movie reaches its conclusion, but rather stays humming in your consciousness forever. John Williams is the deliver of several such scores, but none creates the kind of raw emotional kinship as this one. 4) The 3D of Jurassic Park 3D really works, never feels forced or disparate with the intent of the original release, and enhances the picture to a whole new level of awesome. Some of the movie’s most iconic visuals (the Brachiosaurus reveal, the helicopter flying over Isla Nublar main theme money shot, the T-Rex foot stomp) are that much better in 3D. It speaks to Steven Spielberg’s original cinematography and his ability to give each shot such wonderful contrast and juxtaposition. 5) Once a movie (and one of the preeminent works in the history of the modern summer blockbuster), Jurassic Park must now be considered one of the best motion pictures of the last thirty years of cinema. If you have never seen it, the loss has been yours, but you must see it in theaters now. 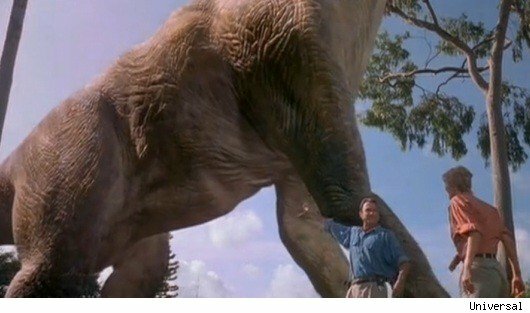 If you are like me and have such meaningful and lasting childhood memories of the world of Jurassic Park, don’t be so preoccupied with whether or not you could (go see it again), you need to stop and think because you should.